As Honey Bunny and Pumpkin so sagely taught us in the opening scene of Pulp Fiction, it’s important for petty thieves to think things through before conducting a robbery. It’s a lesson that could have been of great benefit to the four American tertiary students who, in 2004, planned to relieve their university library of a number of extremely rare and valuable books. 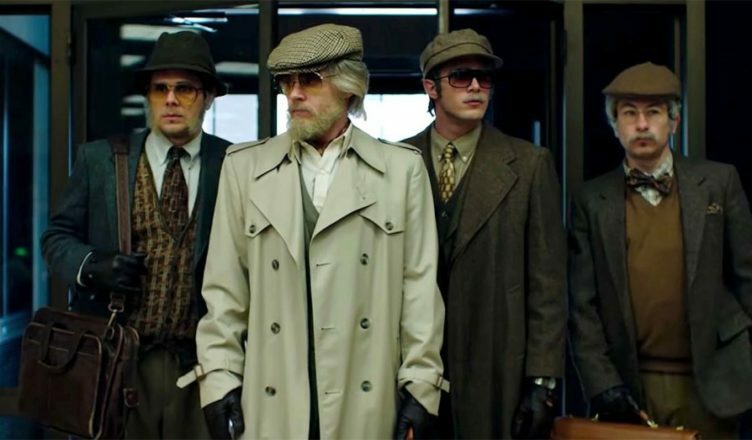 Their plot, and the impulses that drove them, are the subject of American Animals, an absorbing, detailed, unintentionally humourous account of the hare-brained heist that blends expository interviews with the real culprits with the movie recreation of the events. It’s odd that these four didn’t pick up on the wisdom of Honey Bunny and Pumpkin, too, because they actually reference Quentin Tarantino’s film Reservoir Dogs at one point as they plan their crime. Regarding themselves as cool criminals in the mould of Steve McQueen from The Thomas Crown Affair, they plot out their heist in what they think is great detail, only to witness reality come crashing in once the moment of truth occurs. As amusing as their incompetence is – conducting a major robbery in the middle of a school day in a building full of people should have been a hint that this was a bad idea – the caper is played fairly straight by British director Bart Layton (The Imposter). With a nod to the Rashomon effect, not all the versions of the plan match up, and the trust they had in each other was certainly not equal. Were there really international buyers ready to pay millions for the books? Or was something else going on? Some heist movies cheekily invite you to admire the ingenuity of the crims and even to get a vicarious thrill out of the possibility the robbers might get away with it. The original Ocean’s 11, The Italian Job and the aforementioned Thomas Crown Affair are prime examples. You could even include Heat. Here, however, you’re the observer of some very peculiar behaviour that is far from admirable, yet quite enjoyable, not the least because it shows again how ultimately crime doesn’t pay and how greed and the adventure of committing crime can obliterate all traces of common sense. With Venom, Marvel Studios have now officially hit the bottom of the barrell as one of its third-rate, C-grade creations known mainly to Marvel’s fanboy base gets his own mediocre movie. Tom Hardy plays a gung-ho reporter whose body becomes host to an alien sludge that transforms him into a large Alien-like beast with large almond eyes, a smiling mouth full of nasty teeth and a rather winning sense of humour. Apart from a handful of laughs, the film is an ugly, largely incomprehensible mess, its swirls of frenetic action set mostly at night, making it tough to figure out precisely what’s going on. It’s also, to be honest, a tad boring, despite Hardy’s valiant attempt to give the character a moral heart. For those who care, Venom is part of the Spider-man universe and he, in turn, is part of the Marvel universe. But Spider-man and Venom are owned by Sony while Disney owns Marvel. So seeing Spider-man in those Avenger films took a lot of studio wheeling and dealing. And though the Marvel stamp is on Venom’s opening credits, the plan right now is for Venom to stay within Sony’s Spider-man world, though its possible for a deal to be made where he enters the Marvel space to join the other superhero characters. Though Venom is yet to prove itself with audiences – it’s already struck out with critics, who are not the guide they once were to a film’s popularity – there are already two Venom sequels on the books. So there’s faith for you. By the way, Hardy was one of the producers here, obviously keen to get a nice big slice of that lovely superhero franchise action. Smart guy. A small struggling rural town is brought back from the brink via cricket as a forward-thinking local man, Troy Carrington (Damian Callinan) rebuilds the local team by recruiting multi-cultural members through the local refugee centre. Naturally, the small-town setting gives rise to small-minded thinking as stalwart locals, such as Bull Barlow (John Howard), rally opposition to the new team, seeing it as an affront to their Aussie sense of identity. Even the team has its bigots, with Carpet Burn (Angus McLaren) enthusiastically knocking heads with some of his foreigner team mates. There’s no question the film, directed with careful attention not to offend by Mark Grentell (Backyard Ashes), has its heart in the right place as the film bounces around the idea of accepting people of other lands into the community. If only the film was funnier. There is a stilted feel to the pace and too much caution in its messaging, proving that nothing dilutes fun quicker than preaching. Adapted from the one-man play by Melbourne comedian Damian Callinan (who wrote the screenplay, stars and produces) the film proved a big hit when it played as the centrepiece at the Melbourne International Film Festival, building expectations for its cinema run. Now on its last legs after four weeks of theatrical release, The Merger can’t be said to have done all that well, with a local box office take of around $400,000. Hope remains that once it hits the stream the film will connect with the audience it struggled to find via the cinemas. With a relentless work ethic, Damian Callinan has been a fixture on the Melbourne comedy scene for two decades. A universally respected live act, he tours relentlessly. A specialist in creating hit one-man shows – The Lost WW1 Diary; Swing Man; Spaznuts; Sportsman’s Night; Proxy Heroes – he has been nominated three times for the Melbourne International Comedy Festival’s Barry Award. Callinan created The Merger as a stage work after being commissioned by Regional Arts Victoria and Vic Health, the brief being to address the problem regional towns were encountering with xenophobia and racism. The piece proved extremely popular once he began performing the one-man show in 2010, a common response to the play being that it would make a great film. Yet adapting the play into a film proved a tough task, though Callinan says it has whetted his appetite to do more screenplays. A week after the release of The Merger, Callinan was kind enough to carve some time out of his busy schedule to sit down and talk about the making of The Merger, and other things.